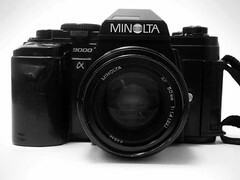 The Minolta 9000 was introduced in 1985 and was Minolta's first professional autofocus SLR. It was called Maxxum 9000 in the USA and Alpha 9000 in Japan. Capabilities achievable thru accessories were extremely far-reaching for its time, including 6fps motor drive, digital backs to add exposure programs, an interchangeable video CCD back (SB-90, see SB-70), a 100-exposure professional film back, and a full line of AF lenses and flashes. Shutter: Focal plane shutter with speeds 30 sec. to 1/4000 sec. 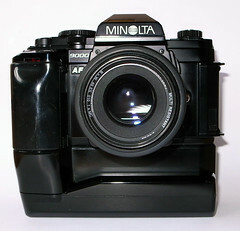 Flash: hot shoe for Minolta AF-flashes, TTL controlled operation, shutter synchronized for speed 1/60, 1/125 and 250 sec.